Mozilla's anti-gay CEO and conservative First Amendment hypocrisy. 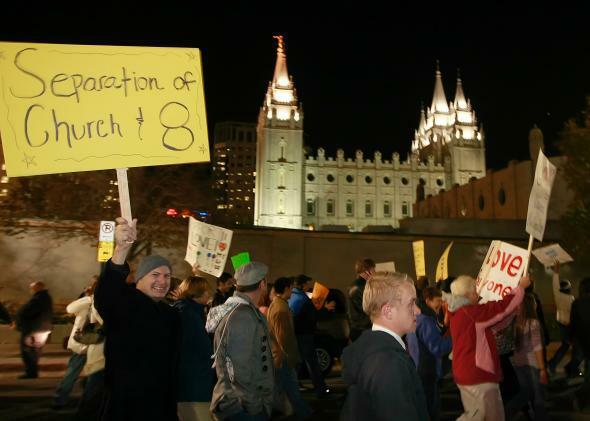 Thousands gather outside the world headquarters of the Church of Jesus Christ of Latter-day Saints in Utah to protest the Mormon church’s support for Proposition 8 in 2008. A repeated cry in conservative and libertarian circles over anti-gay Mozilla CEO Brendan Eich’s resignation is that the company is somehow trampling Eich’s free speech rights. Eich, as you’ve surely heard, donated $1,000 in 2008 to California’s Proposition 8 campaign, which successfully outlawed gay marriage in that state before getting shot down by the courts. It’s true that, because of this donation, Mozilla’s leaders and board members pressured Eich to resign. But it’s absurd and hypocritical to claim that this pressure constituted an infringement of Eich’s legal rights. Let’s start with the obvious: It is literally impossible for Mozilla to violate Eich’s constitutional freedom of speech. At the risk of sounding pedantic, the First Amendment applies exclusively to state actors, like Congress or state legislatures, so a private corporation like Mozilla simply cannot infringe upon an employee’s free speech rights, even if it wanted to. There is no wiggle room around this point. It is a basic constitutional fact. But I can already hear the inevitable retort: Sure, Mozilla wasn’t literally trampling on Eich’s First Amendment rights, but it was violating the broader principles of free speech and free association. This argument is strikingly one-sided and opportunistic. Corporations like Mozilla, for better or worse, are also endowed with significant rights of free speech and free association—for instance, the freedom of Mozilla’s board and leadership to condemn Eich’s anti-gay actions. And make no mistake: Freedom of association includes the freedom of exclusion, particularly the freedom to exclude from your private organization an individual whose conduct is inconsistent with your values. Mozilla’s decision to seek Eich’s resignation implicates the same First Amendment principles that famously allow the Boy Scouts to exclude gay troop leaders. Oddly, however, I don’t see defenders of Eich also criticizing the Boy Scouts for excluding gay men because the organization disagrees with their conduct and beliefs. Nor do I even see conservatives taking Mozilla’s rights as a private corporation seriously—a predictable hypocrisy made especially obnoxious in light of last week’s widespread right-wing praise of the corporate plaintiff’s claim in Hobby Lobby. This is the conservative double standard in the realm of corporate rights: When the corporation supports a right-wing pet project—say, denying women reproductive care—conservatives pen encomia to the First Amendment’s corporate protections. But when a corporation dares to support a progressive cause like gay rights, conservatives cry foul at its alleged censorship of individual views. It’s really no surprise, of course, that the right wing views Mozilla’s objections to Eich’s anti-gay activities as censorship and Hobby Lobby’s objection to birth control as religious liberty. We’ve known all along that conservatives’ quiver of defenses for corporate rights have only been employed to further its own agenda. The right wing’s backlash over Mozilla’s move only further proves that opportunism, rather than principled dissent, drives its frantic charge for full corporate personhood. Keep that in mind as the conservative outrage machine takes aim at Mozilla for daring to exclude a man whose values and conduct it finds unacceptable.